Euglena is a large Genus of unicellular Protists, which belongs to phylum, Euglenaceae. Thousands of species of Euglena are present in ponds, lakes, streams and also in the waterlogged area such as marshes. 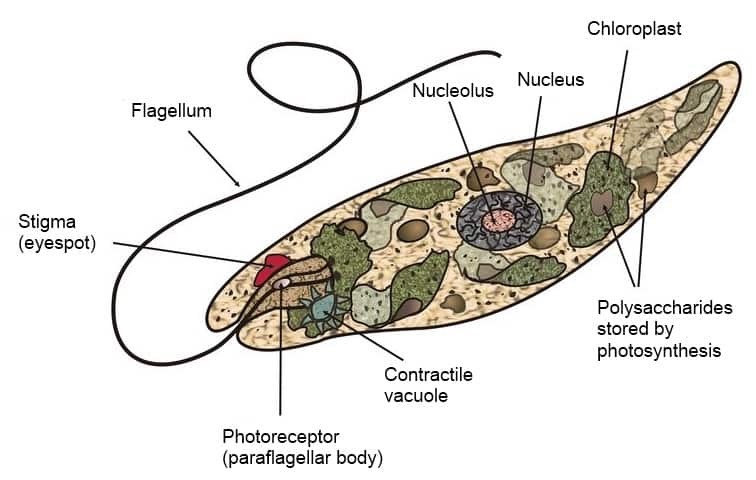 Euglena is interesting because certain members of this group of protists can lead double lives. In presence of light and absence of organic matter, they are green and photosynthetic like the plants. That means they can make their own food. When there is sufficient sunlight, it uses its Chloroplasts (containing pigments like Chlorophyll a and Chlorophyll b) to produce sugars by photosynthesis. But in the presence of organic matter or in the presence of light, they also eat and absorb food like the animals. It takes in tiny plants and animals much like the animals. It takes in tiny plants and animals much like the Amoeba and Paramaecium. Their daily dining menu may include bacteria and some tiny algae. Because of their ability to live a double life, scientists argued for years about which kingdom to keep them in Animal or Plant. Most of the time, they were included in the Plantae Kingdom by Botanists and in the Animalia Kingdom by Zoologists. Also Read: Why is the Two-Kingdom Classification System Inadequate? Right now they are in neither of the two kingdoms i.e. Plantae & Animalia. They are now kept in the Protista kingdom with other microscopic organisms, such as Amoeba and Paramaecium. Probably, the occurrence of such organisms with such flexible lifestyles has lead scientists to add an intermediate eukaryotic kingdom of Protista. NCERT, Biology: Textbook for Class XI. New Delhi: NCERT, 2006. Print. En.wikipedia.org. (2018). Euglena. 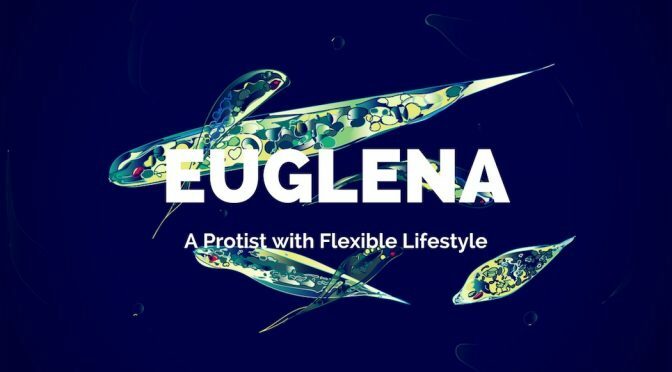 Available at: https://en.wikipedia.org/wiki/Euglena. Previous PostWhat is Southern Blotting?Next PostBacterial Conjugation – A Primitive form of Sexual Reproduction.